When Colorado became the first state in the world to fully legalize recreational marijuana this week, one local described the war on drugs as over. But what is the war on drugs? And what have its consequences been? The House I Live In is a documentary about the war and its impact on ordinary Americans. This is a comprehensive look at the war on drugs, from its beginnings under Richard Nixon, to its escalation under Reagan through the huge amount of damage it has done and the lives it continues to ruin today. The politically popular policies of heavy sentencing are shown to be tools to suppress groups in society through mass incarceration, with countless examples given. 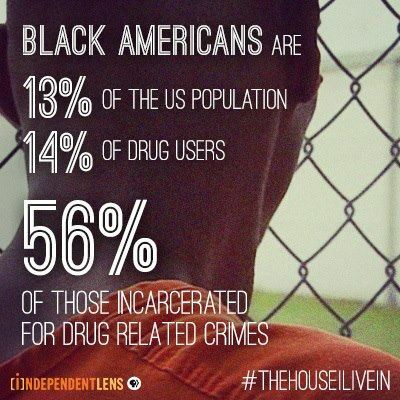 These include the massively disproportionate sentencing for crack versus powder cocaine to protect the wealthy white users of the latter versus the generally poor, black users of the former, and the way drug hysteria has usually been linked to their association with counter cultures. It examines the social causes of drug addiction and dealing, from the decline of industry to the ghettoization of poor communities, and speaks to individual drug users, prisoners, law makers and police officers for their views on the topic. As a documentary it’s brilliantly made with a calm, sober tone, demonstrating the vast extent of this failed policy. Documentary maker Eugene Jarecki ties it to his past experiences including the death of a childhood friend, giving it a personal feel. But it never loses any of the sense of scale necessary to accurately describe this most disastrous of government initiatives. Much of the film is highly shocking; from personal stories, like a man sentenced to life without parole for possession of crystal meth; to blunt statistical facts, like the size of the US prison population. The cycle created by tearing apart families with draconian drug laws, that in turn leads to more hopeless communities and more dependency on illegal activity to earn money, shows that the people portrayed as the enemy by politicians and the media are really victims of circumstance. As one person accurately puts it, the war on drugs treats a health problem like a criminal one, and this is why it has failed. It also looks at the motivations for those in support of the war, from a genuine if misguided desire to tackle drug abuse, to the financial interest of the prison industry and political cowardice. But once the credits role, you will hardly believe anyone continues to support this approach. Jarecki’s passion for his cause and evident desire to provoke action shine through in this documentary which should be viewed by every lawmaker in the US.